Ellen Burstyn, Kris Kristofferson, Billy Green Bush, Harvey Keitel, Diane Ladd, Lelia Goldoni, Jodie Foster, Arthur Lutter. A delightful film which should provide satisfying and thoughtful entertainment for many audiences. Ellen Burstyn’s award-winning performance as widow Alice, trying to get and keep jobs to support herself and her spoilt, precocious 12 year old son, is admirable. An old-fashioned movie prologue, sentiment mixed with bluntness, sets an atmosphere of human warmth blended with realism (and some quite hilarious vulgarity). Some American films can create a convincing picture of places and people, show the people as real, in their pain and in their happiness. This is certainly one of those films. 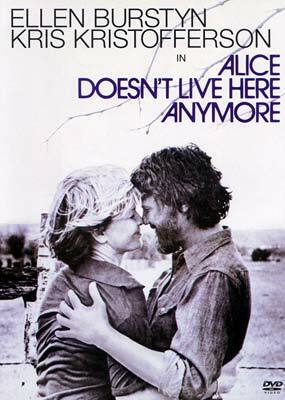 Kris Kristofferson and Diane Ladd give excellent support to Ellen Burstyn's moving Alice. 1. The significance and tone of the title, the emphasis on Alice, the immediate presentation of her as young, the implications of dwelling in a place, in times of growing up, in times of marriage? Jobs, her son, moving on? The overtones of yearning, the need for a home, the road? 2. The importance of colour, the New Mexico locations, the California dream? The details of the towns, ranches, rooms, cafes, etc.? Alice understood in this environment? 3. The importance of the music, piano accompaniment, the song, "You'll Never Know" Alice's songs, her singing for work, the background score and atmosphere? 4. The atmosphere of 1974 when the film was made, the focus on woman and their difficulties, insight into women? Ellen Burstyn and her Oscar for this performance? 5. The significance and tone of the opening, the romantic overtones, the memories of Hollywood musicals of the 40's. Alice as a young girl, her ambitions and yearnings the touch of harsh reality and language at the end of the opening? 6. The transition to Alice at 35? Her sense of achievement or lack of achievement, what kind of woman was she, her strengths and her weaknesses, her dreams and the drab reality, her character as revealed in her language, her commentary on things? The portrayal of the sullen husband and the difficulties of interaction at meals, for instance? Her love for Tom, but his pranks and precociousness? Her inability to cope, the meal sequences, the encounters with her husband? How much empathy did the portrayal of Alice elicit from the audience? 7. What did the film have to say about marriage and its meaning? The effect on both parties? How was this highlighted when Donald was killed and its effect on Alice? Her realisation of her love, the awareness of loneliness? The importance of the funeral? The friendship of her neighbour? Their discussions? The pathos of the farewell and need to move on? 8. The significance of Monterey as a dream? Alice going back into the past? Romanticising the past for an unreal future? Her singing, wanting to move towards California? How unreal were Alice's dreams? Was she destined to disillusionment? The need for settling? The final ability to settle? Monterey being left? The irony of the final cafe being called "Monterey"? Was the ending of the film optimistic insofar as Alice had decided to settle? 9. The background of poverty, the importance of money, humdrum jobs, the weariness of searching for jobs, the auditions and the strain on Alice, the interest and lack of interest in the owners? The picturing of the motels, the humiliation for people who were poor? The importance of the song, "Collages" within this context? 10. How well drawn was the character of Tom ? As the son of Alice? As different from her? How precocious was he? Why? The film's insight into the world of a young boy? The strain of living with his mother. his father's death, being on the road, living in motels? The language and the outlook that he had picked up from Alice? His being bored while waiting? His willingness to help his mother? The quality of the bond between the two? 11. The significance of the encounter with Ben, his style and smooth talking, Alice being taken in, the nature of their liaison, the effect on her. lack of loneliness, deceiving Tom? The irony of Rita's visit? The atmosphere changing from pathos to danger? The violence of Ben and its effect on the two women? Alice in her fright and the leaving of the motel? What did she learn from this? How hardened did it make her? 12. Her achievement in getting a job as a waitress, the hard work and its visual presentation, the various others working at the place? Flo and her character her way of talking, her foul mouth and its effect on Alice? How well did the film detail and communicate pressures, the nature of the work? The realism? The significance of the clash with Flo and the significance of the reconciliation? Their sharing of points of view, interests? Mutual support? 13. Audience sympathy for David? His arrival for breakfast, his genial nature, his influence with Tom, the guitar? His life at the ranch? David as a challenge to Alice? The joy in their relationship? Mistrust? Alice and her hesitance after her experience? David and his needs? The spanking of Tom as an issue for these worries to surface? 14. The irony of Audrey and the change of name? As a friend to Tom? As a mixed-up child ~ what Tom might have been? Their lessons, talk, drink? Audrey's mother? 15. How well did the film build up to the crisis for Alice with Tom, David, Flo? Her breaking? Her needing to settle? 16. The final sequence of give and take on the part of Alice and David? Decisions and the finding of some meaning? The symbol of the Monterey cafe in Tucson? 17. How humane a film: the quality of its insight. feeling? How credible the characters and the situations? Strengths and weaknesses of human nature? Isolation, emptiness. hope and love? A modern parable?